BETHLEHEM (Ma’an) — President Mahmoud Abbas on Sunday warned international leaders at the UN General Assembly of the potential danger of ongoing events at the Al-Aqsa Mosque compound in occupied East Jerusalem. Abbas told Palestine TV that he had told world leaders in a series of meetings at the sidelines of the UN session in New York that “the whole world” should be aware of what is happening at the mosque compound. 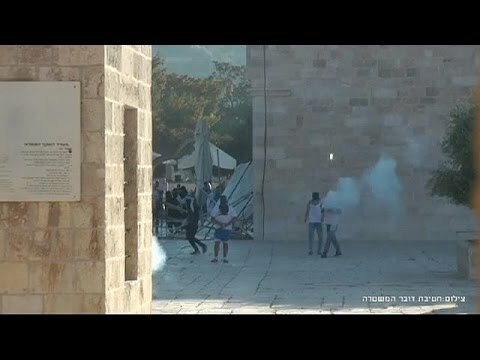 Monday saw the second straight day of violent clashes between Israeli police and Palestinian protesters at the site, which is the third holiest in Islam. Abbas told leaders that Israel is seeking to change the nature of the conflict from a political to religious one. The president said that he asked the leaders to exert pressure on Israeli Prime Minister Benjamin Netanyahu to implement signed agreements between Israel and Palestine. He also said that he was ready to resume peace talks if Israeli authorities agree to cease settlement construction and to release a number of Palestinian prisoners jailed before the 1993 Oslo Accord. Israel has so far released three groups of pre-Oslo prisoners and was scheduled to free a fourth group but canceled the release after President Abbas applied for membership of 15 UN conventions. Abbas reportedly met with a number of senior Arab and European officials. He also met with US President Barack Obama and US Secretary of State John Kerry over the weekend. He is currently scheduled to deliver a speech before the General Assembly on Wednesday, where he is expected to urge the international community to “commit to its responsibilities” concerning Palestine. Earlier this month, the president told London-based Al-Quds al-Arabi that he planned to “drop a bombshell” during his speech. In July, sources told Ma’an that he would use the UN session to discuss his own future in Palestinian politics, amid speculation that he plans to resign as Palestinian president.